Overcoming fear is one part of living life without regret. You do that by being open to new people and new experiences, and by acting even when you're afraid. Another aspect of a rewarding life is learning to find happiness in your daily existence — and building upon that happiness to construct a meaningful life. Today, in the second part of this limited series on mastering your life, I want to share what I've learned about how to be happy. To some extent, a good life requires good fortune. Happenstance can undermine the well-being of even the most virtuous person. But Aristotle held that ultimately happiness isn't a product of chance. You can allow misfortune to crush you, or you can choose to bear the blows of fate with “nobility and greatness of soul”. Although fate may play a role in your affairs, Aristotle believed that in the end, happiness depends upon yourself. About half of human happiness is biological. Each of us seems to have a happiness “set point” which accounts for roughly 50% of our level of contentment. Because this set point is genetic, it's tough to change. Another 10% of happiness is circumstantial — based on external factors. These include traits like age, race, nationality, and gender, as well as things like marital status, occupational status, job security, and income. Your financial situation is part of this 10% — but only a part — which means it accounts for a tiny fraction of your total happiness. The final 40% of happiness comes from intentional activity — the things you choose to do. A huge chunk of contentment is based on your actions and attitude. You can increase your level of well-being through exercise, gratitude, and meaningful work. Because circumstances play such a small role in your well-being — and because many of your circumstances are unchangeable — it makes more sense to boost your bliss through intentional activity, by controlling the things you can control while ignoring the things you can't. You can't wait for someone or something to make you happy. Happiness isn't something that just happens; happiness is a byproduct of the the things you think and say and do. Just as you ought to become a money boss to take charge of your financial life, you ought to become a happiness boss to take charge of your emotional life. Believe it or not, you can control your emotional responses. It just takes a bit of knowledge and practice. For fifty years, psychologist Mihály Csíkszentmihályi (pronounced “me-high cheek-sent-me-high-ee”) has studied human happiness and creativity. Much of his work has focused on flow, which is his term for “optimal experience”. We have all experienced times when instead of being buffeted by anonymous forces, we [feel] in control of our actions, masters of our own fate. On the rare occasions that it happens, we feel a sense of exhilaration, a deep sense of enjoyment. People are happiest when they forget their surroundings to focus on doing their best at something that challenges and interests them. In short, happiness is produced by total engagement in the pursuit of excellence. We can experience flow during activities as basic as riding a bike or as complex as building a bridge. Sometimes flow is achieved through physical activity. Athletes refer to this state as “being in the zone“. People achieve this state of bliss while climbing mountains, sailing boats, or swimming oceans. But even mundane activities like cleaning the kitchen or doing taxes can produce flow, if they're done well. Peak experience also comes from mental pursuits. Many computer programmers become so engrossed in their work that time streams past like water. I experience flow while writing. Today, for instance, I've been deeply engrossed in editing this article. As I'm working, my mind is so active and so engaged that it almost feels euphoric. I'm happy. I can't imagine wanting to be anywhere other than in front of my computer, writing about money. I am in a state of flow. To learn more, pick up a copy of his book, Flow: The Psychology of Optimal Experience. 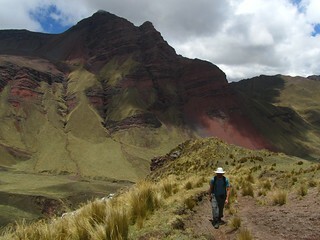 I've found flow while hiking in the Andes. I've experienced it while writing. I've achieved it while making boxes in a factory, while preparing a speech, and while mowing the lawn (for real!). Though each of these activities was very different, they shared some commonalities that helped me get “in the zone”. This made me wonder: Can happiness be somehow be cultivated? Turns out, it can. A challenging activity that requires skill. Flow occurs at “the boundary between boredom and anxiety, when the challenge is just balanced with the person's capacity to act.” To experience flow, you have to be doing something difficult — but not too difficult. A sense of control. During the flow experience, you feel in control — or that you could be in control. More precisely, you aren't worried that you might lose control, a state so typical of much of modern life. To achieve flow, you must believe that you're able to influence the outcome of whatever it is you're doing. The loss of consciousness. During a peak experience, you lose sense of who you are. You become one with your environment, a part of a greater whole. You're no longer aware of yourself as an individual. According to Csíkszentmihályi, “The key element of an optimal experience is that it is an end in itself.” You might need to complete the task you're working on for other reasons, but you'd do it even if it weren't required. You're doing it not for some future benefit, but because the task itself is so rewarding. 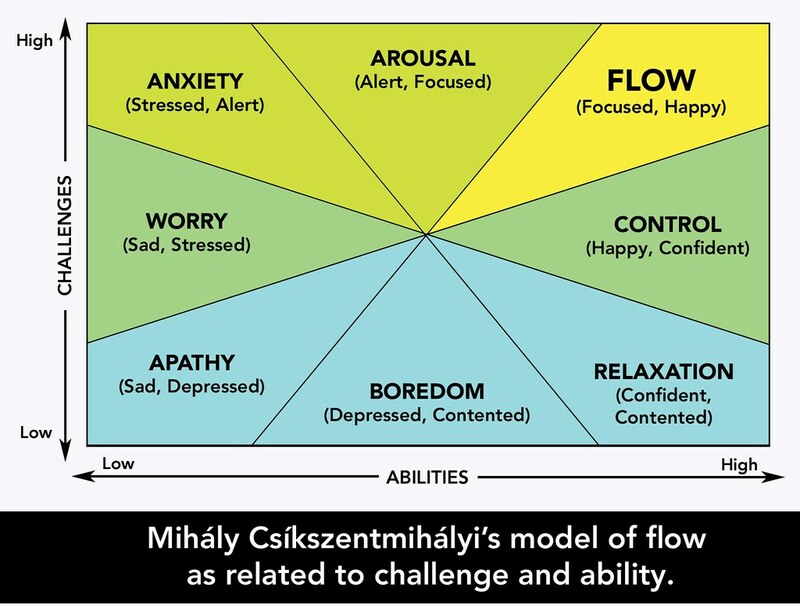 But here's the thing: Flow doesn't just happen. These optimal experiences can be encouraged and fostered. You can become happier by changing where you focus your attention. The objects and events around us exist in an objective world. They are what they are. Yet each of us experiences these objects and events in a different way. What happens outside must pass through the filter of your subjective mind before it enters your consciousness. You control what enters your consciousness (and, thus, what enters your awareness and memory). We shared the same experience — and yet we didn't. “Consciousness corresponds to a subjectively experienced reality,” Csíkszentmihályi writes in Flow. “A person can make himself happy, or miserable, regardless of what actually happens ‘outside', just by changing the contents of his consciousness.” We choose what we experience, and we choose how we interpret those experiences. This idea can be challenging to people who possess an external locus of control, those who believe that their decisions and life are controlled by chance or fate or greater environmental factors. [Happiness] is not the result of good fortune or random chance. It is not something that money can buy or power command. It does not depend on outside events, but, rather, on how we interpret them. Happiness, in fact, is a condition that must be prepared for, cultivated, and defended privately by each person. People who learn to control their inner experience will be able to determine the quality of their lives, which is as close as any one of us can come to being happy. The shape and content of your life depends on how you use your attention. People who master what happens in their heads tend to be happier than those who don't — or won't. The bottom line? Garbage in, garbage out. If you allow yourself to think negative thoughts, your experience will be negative. If you want a positive experience, you have to accentuate the positive in all that you see and do. Change how you experience external conditions. Each strategy is sound. But one is generally easier than the other. Which path you choose depends upon the situation. Sometimes the best way to boost your happiness is by changing the world around you. Imagine, for instance, that you're sitting at home reading a book. You're comfortable except for one thing: You're warm. Very warm. An external condition is causing you discomfort. You could change the way you're experiencing this condition (by removing all of you clothes, say), but in this case it probably makes more sense to change the condition itself by lowering the thermostat. Or maybe you're sitting in a restaurant writing a letter. Things are fine except that the place is too noisy, which is distracting. Your best bet is to change locations, to change your environment. The trouble, of course, is that you have little control over the world around you. When you reduce the size of your immediate environment — stepping from outdoors to indoors, for instance — you make it easier to control external conditions. You can't reduce the outside air temperature, but you can cool a room or a building. Even then, exerting influence over your environment requires a great deal of effort and energy. Usually, the most effective way to boost your happiness isn't by changing external conditions, but by changing how you experience external conditions. Now imagine you're reading in the park. It's cold. The sun is out, but the air is chilly. You could head indoors, but you're enjoying the lovely day. The solution is to change how you're experiencing the world around you. Put on your jacket and some gloves. You haven't altered your environment, but you've changed how you're experiencing it. Or maybe you're backpacking through Europe, staying in hostels and cheap hotels. Sometimes it's tough to sleep because the walls are thin and there's nothing covering the windows. Light and noise threaten to keep you awake all night. Again, the best solution is to change the way you experience the external conditions. If you wear an eye mask and earplugs, you can rest comfortably despite the chaos around you. Most people recognize that they have limited power over their physical world, but many cling to the belief that they can change the behavior of the people around them. In reality, changing others can be nearly as difficult. 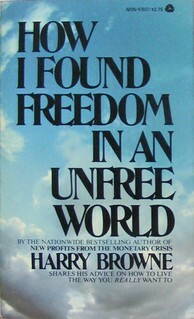 Writing in How I Found Freedom in an Unfree World — a book we'll discuss at length in part three of this series — Harry Browne calls the idea that you can (or should) control what others do the Identity Trap. [You can't] assume that someone will do what you've decided is right. You've decided it from your unique knowledge and interpretations; he acts from his knowledge and his interpretations. You're in the Identity Trap when you assume an individual will react to something as you would react or as you've seen someone else react. If you're unhappy with somebody, there are two options. You can attempt to change the other person, or you can change how you interact with that person. You're almost always better off changing yourself — altering your expectations, accepting new premises — than you are attempting to change the other person. You could make everyone else be, act, and think in ways of your choosing if you were God. But you aren't. So it's far more useful to recognize and accept each person as he is — and then deal with him accordingly. You can't control the natures of other people, but you can control how you'll deal with them. And you can also control the extent and manner in which you'll be involved with them. The paradox is that you have tremendous control over your life, but you give up that control when you try to control others. For the only way you can control others is to recognize their natures and do what is necessary to evoke the desired reactions from those natures. Thus your actions are controlled by the requirements involved when you attempt to control someone else. People suffer a great deal of unhappiness because they assume that everyone wants the same things — or that they should want the same things. But each person is different, with her own knowledge, experience, preferences, and attitudes. You can improve your quality of life by either changing your environment or by changing how you interact with your environment. Both strategies have their place, but one is generally much easier and more effective than the other. In most cases, it's difficult or impossible to change the world around you. Attempting to do so simply leads to frustration and unhappiness. But it's almost always possible to change how you perceive the world around you. In fact, it's this ability that contributes most to day-to-day contentment. As children, we're conditioned to ask permission whenever we want to do something. You need permission from your parents to leave the dinner table or to go outside and play. You need permission from your teacher to use the bathroom. Even as adults, we feel compelled to request permission. You need permission from your boss to leave work early. You need permission from your spouse to grab drinks with your friends instead of weeding the garden. You need permission from the city to build a shed in the backyard. As a result, most of us have developed an external locus of control. That is, we subconsciously believe we need permission to do anything. In personality psychology, the term “locus of control” describes how people view the world around them, and where they place responsibility for the things that happen in their lives. Though this might sound complicated, the concept is actually rather simple. If you have an internal locus of control, you believe that the quality of your life is largely determined by your own choices and actions. You believe that you are responsible for who you are and what you are. If you have an external locus of control, you believe that the quality of your life is largely determined by forces beyond your control, by your environment or luck or fate. You believe that others are responsible for who you are and what you are. Most people respond to the system of rewards and punishments that has evolved in the culture that surrounds them. If your culture prizes material gain, wealth becomes important to you. If it emphasizes familial relationships, family becomes important to you. Lasting happiness can be achieved, but not by being a puppet whose strings are pulled by situation and society. To achieve long-term happiness (and meaning), you have to develop the ability to find enjoyment and purpose regardless of your external circumstances. You have to create a system of internal rewards that are under your own power. If you're unhappy, nobody else can make things better for you. You must make things better for yourself. Focus on the things you can control, and use that control to fix the other things that are broken. In this way, you'll gradually gain confidence and greater control of your future well-being. You live in a world of your own design. You have the power to choose. You create your own certainty. Life as you want to live, and do so without regret. Give yourself permission to do so. Caveat: It's okay to seek happiness by changing jobs or moving to San Diego. It's not okay to steal your neighbor's television or to drive on the wrong side of the road. Remember the Golden Rule. Enjoy your life without diminishing the ability of others to enjoy theirs. Julian B. Rotter developed the locus of control concept in 1954 as part of his social-learning theory of personality. Stephen R. Covey popularized the idea in 1989 with his best-selling The Seven Habits of Highly Effective People. Like Mihály Csíkszentmihályi, Covey believes that we filter our experiences before they reach our consciousness. “Between stimulus and response,” he writes, “man has the freedom to choose.” Our self-awareness, imagination, conscience, and independent will give us the power to select how we'll respond to each situation in life. Covey says there are two types of people: proactive and reactive. Proactive people recognize that they're responsible for how they respond to outside stimuli. In Rotter's terms, they have an internal locus of control. They don't blame circumstances, conditions, or conditioning for their state. They believe their existence is largely a product of personal choice derived from personal values. Reactive people believe their condition is a product of their physical and social environments. They have an external locus of control. Their moods are based on the moods of others, or upon the things that happen to them. They allow the outside world to control their internal existence. To illustrate the difference between proactive and reactive people, Covey discusses how we focus our time and energy. We each have a wide range of concerns: our health, our family, our jobs, our friends; world affairs, the plight of the poor, the threat of terrorism, the state of the environment. All of these fall into what Covey calls our Circle of Concern. 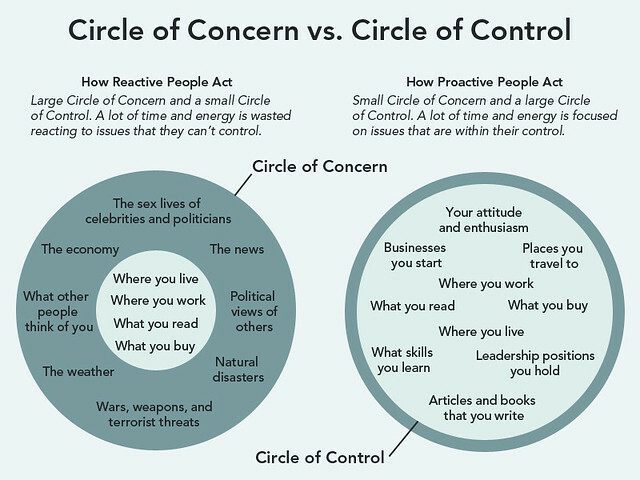 Within our Circle of Concern, there's a subset of things over which we have actual, direct control: how much we exercise, what time we go to bed, whether we get to work on time; what we eat, where we live, with whom we socialize. These things fall into what Covey calls our Circle of Influence, which sits inside our Circle of Concern. According to Covey, proactive people focus their efforts in the Circle of Influence. They spend their time and energy on things they can change. This has two effects. First, proactive people actually do affect change in their lives; and as they do so, their Circle of Influence expands. On the other hand, reactive people tend to focus on their Circle of Concern. They spend their time and energy on things they're unable to influence (or can influence only with great difficulty). They try to change other people, to correct social injustices, to shift thought patterns of states or nations. Their efforts are largely frustrating and futile. What's more, as they focus on their Circle of Concern, their Circle of Influence begins to shrink from neglect. Any time you shift your attention from your Circle of Influence to your Circle of Concern, you allow outside forces to control you. You place your happiness and well-being in the hands of others. If you don't act for yourself, you're doomed to be acted upon. It's not what happens to us, but our response to what happens to us that hurts us. Of course, things can hurt us physically or economically and can cause sorrow. But our character, our basic identity, does not have to be hurt at all. In fact, our most difficult experiences become the crucibles that forge our character. Most people are reactive. It's likely that you're reactive too — at least to some degree. Don't fret. I'm reactive also. But with time and effort, I've managed to shift from an external locus of control to one that's primarily internal. You can too. Focus on the things you can control. Use that control to remove constraints and complications from your life. Strengthen and stretch your Circle of Influence. This is the only path to changing your Circle of Concern. You have no control over the hand you're dealt, but you can choose how to play the cards. Exercise: Here's a simple idea from Seven Habits. For thirty days, commit to working only on your Circle of Influence. How? Keep your commitments, to yourself and others. Don't judge or criticize other people, but turn your attention inward. Don't argue. Don't make excuses. When you make a mistake, accept responsibility and fix it. Don't blame or accuse. When you catch yourself thinking “I have to…” or “If only…”, stop yourself and choose to reframe the thought in a more positive light. As far as possible, accept responsibility for your circumstances, actions, and feelings. 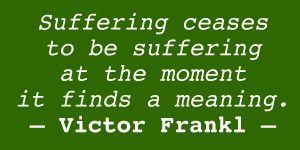 Victor Frankl was an Austrian psychiatrist who survived the Nazi death camps during World War II. The extreme suffering and harsh conditions caused many inmates to lose their will, to welcome death. Everything can be taken from a man but one thing: the last of human freedoms — to choose one's attitude in any given set of circumstances, to choose one's own way. Frankl's experience served as a crucible for his theory of personality development, which he called logotherapy. Before him, Alfred Adler had argued that people possessed a Nietzschean “will to power” (more here), and Sigmund Freud had argued that we're all motivated by a “will to pleasure” (more here). Frankl, on the other hand, believed that humans are born with a “will to meaning”, a fundamental need to discover their purpose in this world. Life has meaning under all circumstances, even the most miserable ones. What matters most isn't the meaning of life in general, but the meaning of each person's life in each moment. Humans are self-determining. That is, we don't just exist, but choose what our existence will be. We have freedom to find meaning in what we do and what we experience — or at least in how we respond to each situation. Accepting responsibility for your own fate and attitudes can be uncomfortable and intimidating. There's a kind of solace when you can attribute your situation to the winds of fate, the whims of the gods, or the inner workings of the universe. But recognizing that you're a free agent can be liberating too. When you take matters into your own hands, you shed your fears, create your own certainty, and discover that you're freer than you ever imagined possible. If you struggle to know what you're life is about, you're not alone. I get email all the time from folks who are stumped about what it is they want to accomplish. They know they don't like how things are going, but they're not clear on just what they should do to make things better. First up, let's talk about how to prioritize how you currently spend your time. You lead a busy life. There never seems to be enough time to do the things you really want to do, the things that make you happy. You're too preoccupied with work, errands, and other demands placed upon you by the outside world. Imagine you have a jar. You want to fill this jar with some rocks and some sand. What's the best way to do it? One way is to add the sand to the jar first and then add the rocks. If you did this, however, you'd quickly find that it's impossible to make everything fit. With a layer of sand at the bottom of the jar, there's no room for the rocks. On the other hand, if you begin by putting the rocks in the jar, when you pour in the sand it will sift downward to fill in the gaps and the cracks between the rocks. Everything fits. This same principle applies to your personal life. You can achieve well-being by prioritizing the Big Rocks in your life. This may sound elementary, and you may be tempted to ignore this advice. Don't. This one idea revolutionized my life. It made me happier and more productive. By focusing solely on the things that were most important to me — by making room for the Big Rocks — I was able to reclaim my life and time. A few years ago, after first reading about this idea, I sat down and drafted a list of the things that were most important to me. I decided that my Big Rocks were fitness, friends, writing, Spanish, and travel. If these weren't in my jar, I wasn't happy. So, I made sure to squeeze these in before anything else. Once these rocks were in place, once these things were on my calendar, then I'd fill the remaining space with the sand — television, email, errands, and so on. Because of this simple exercise, I got lots more done and had a better time doing it. Who Are You? — and What Do You Want? In order to get things done, to be productive, to achieve greater meaning and happiness in your life, you need to make sure you're spending more time on the big rocks and less time on the “sand” of everyday life (such as errands and email). But how can you determine which things are important? Near the beginning of his work with each client, Kinder challenges her to answer three questions. These questions are designed to lead the client deeper and deeper into her desires until they reveal her goals and values, the things that bring her meaning and purpose. Kinder shared these questions in his book, The Seven Stages of Money Maturity. Imagine you're financially secure. You have enough money to take care of your needs, both now and in the future. How would you live your life? Would you change anything? Let yourself go and describe your dreams. What would you do if money were no object? Finally, imagine your doctor shocks you with the news that you only have 24 hours to live. Nothing can be done. At this time tomorrow, you'll be dead. What feelings arise as you confront your mortality? What did you miss? Who did you not get to be? What did you not get to do? Answering the first question is easy (and fun). There are many things we'd do if money were no object. But as the questions progress, there's a sort of funnel. They become more difficult to answer, and there are fewer possible responses. Life planning is all about answering that final question. Note: If you'd prefer, you can download a free PDF with a similar exercise that I used in the Money Boss crash course: Your Personal Mission Statement. Someday, I'll update that for Get Rich Slowly. Family and relationships. Ninety percent of responses to the final question contain this topic. Authenticity or spirituality. Many responses involve leading a more meaningful life. Creativity. Surprisingly, a large number of respondents express a desire to do something creative: to write a science-fiction novel or to play guitar like Eric Clapton. Giving back. Further down the list are themes about giving back to the community, about leaving a meaningful positive impact. A “sense of place”. A fifth common theme (though nowhere near as prominent as the top three) is a desire to have some connection with place: a desire to be in nature, to live someplace different, or to help the environment. Kinder says that some people — the facts and figures people — look at the life-planning process and ask, “What does this have to do with money?” It has everything to do with money. When you understand what you want to do with your life, you can make financial choices that reflect your values. All of these questions — and the entire life-planning process — are meant to cause the participant to ask herself, “Who am I as a person, stripped from what I do as a job every day? Is it possible to derive meaning and satisfaction with this stripped away?” Inevitably, the answer is yes. Here's a third and final exercise, which I picked from my friend Jim Collins. 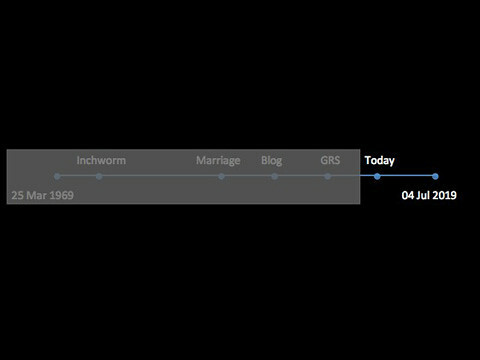 You're going to create a graphical representation of your life — past and future. Before we start, grab a piece of paper and a pencil. Ready? Great! Here's how this works. Step two. For the next step, you'll need to do some guesswork. Based on what you know of your health and your family history, estimate how long you'll live. I know there's no way to be sure — you could be hit by a truck tomorrow, or maybe next week scientists will find the secret to living 1000 years! — but do what you can to best guess the date of your death. 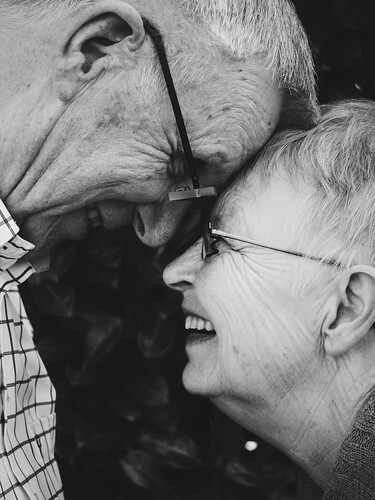 (If you need help, try one of the many on-line longevity calculators, such as the one at livingto100.com.) 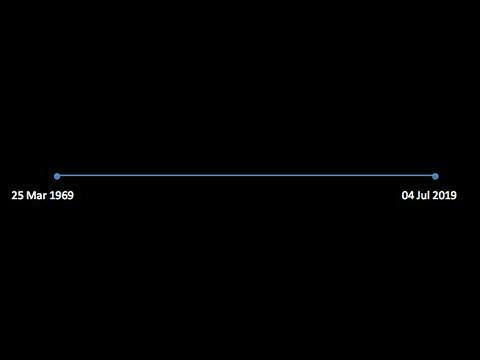 Once you've calculated your projected date of death, write it below the right-most dot. Example: As my long-time readers know, the men in my family don't live long. In fact, they often die on or around their fiftieth birthdays. Also, for strange reasons known only to the universe (or god), many of my family die on or around Independence Day. 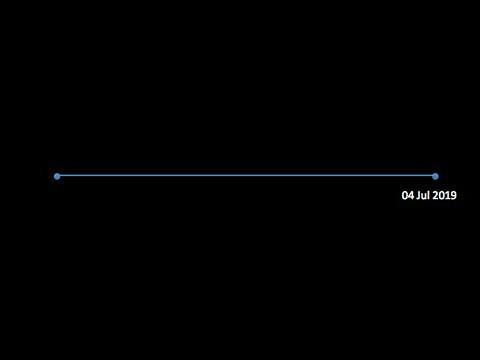 Thus, I often say that I expect to die on 04 July 2019, when I'm fifty. This may sound morbid, but I like to think of it as hedging my bets. I hope to live longer, but I'm fully prepared to have a short life. Step three. Below the left-most date, note your date of birth. On your paper, you've created a visual representation of your lifeline. Step four. The next step requires a bit of math. You're going to add a third point to your lifeline, a point that represents today. “Today” will fall on a different point on the line for each person. To find the proper place for you, divide your current age by your expected lifespan. For instance, I'm 45 and expect to live until I'm 50. For me, the point representing today is located about 10% from the right side of the line. If you're 20 and expect to live until you're 80, your “today” point would be about one-quarter of the way in from the left. And so on. Step five. Finally, choose a handful of major events from your life and place them on the lifeline in (approximately) the appropriate location. You might choose to list your first day of school, your wedding date, or the birthdates of your children. Add three to five major events to your lifeline. 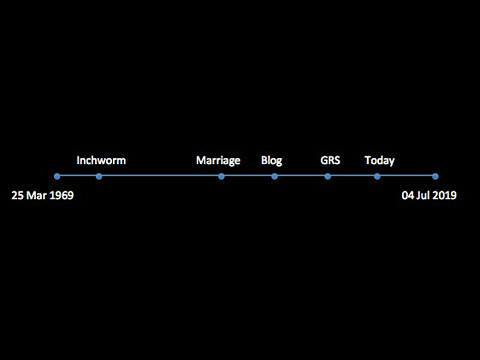 Example: On my lifeline, I've included these key events: Writing “The Meanest Inchworm” in third grade, which was the first clue that I'd one day become a writer. Getting married. Writing my first blog. Selling Get Rich Slowly. Re-purchasing Get Rich Slowly. Your lifeline is now complete. On the piece of paper before you, you have a representation of your life, both past and future. But before we're finished, there's one final step I'd like you to take. Using an eraser, a marker, or another piece of paper, mask everything on your lifeline that comes before today. Blot it out. Hide it. Make it go away. All of the time before today is past and does not matter. What matters is the future: today and everything after. 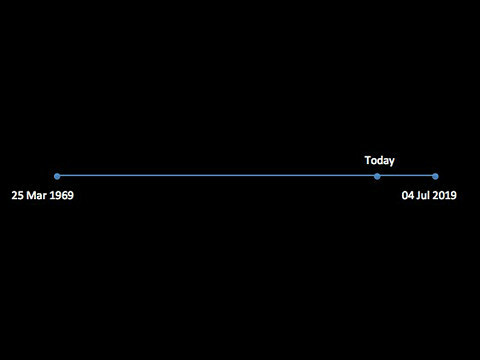 For folks like me, our projected futures contain just a small amount of time. Knowing that, I cannot wait to do the things that I want to do. If your projected future is short, you shouldn't wait either. Don't dwell on the past. You can't change it. Focus instead on making the best quality tomorrow you possibly can. On the other hand, if your projected future is long (say you're 20 and expect to live another 60 or 80 years), cultivate patience. Take time. Make smart choices. Do what you can to set yourself up for future success. And don't get down on yourself just because you've made a few mistakes in the past. The past is the past. Look how much tomorrow lies before you! For another take on this exercise, take a look at the life calendar from Tim Urban at Wait But Why. We covered a lot of material in this article. Let's review what we've learned. You can improve the quality of your daily life by learning to focus your attention and choosing to filter your experiences through a lens of positivity. But while it might be simple to find happiness in a single day, it can be much more difficult to link a series of days into a meaningful whole. Still, just as we must be active agents in creating our own happiness, we must also take an active role to create meaning in our lives. “Creating meaning involves bringing order to the contents of the mind by integrating one's actions into a unified flow experience,” writes Mihály Csíkszentmihályi. To give meaning to life, to achieve this “unified flow experience”, you need a purpose — an overall goal around which your lesser goals are clustered. The path to purpose is different for each of us. Exercises like those I've shared here — the big rocks, the three questions, and the lifeline — can help you identify your personal purpose, but often this process requires many years of experience and soul-searching. Don't feel bad if you haven't found your purpose. And be aware that it takes more than cultivating purpose to make meaning out of life. To make meaning, you must also forge resolve. You must take your goals seriously. If you're not willing to accept the consequences of the goals you set, or to put in the effort required to achieve them, those goals become meaningless. Curiously, it can often be easier to find meaning and purpose by limiting your options. The more choices we have, the more difficult it is to maintain our resolve. Because life is complex (and becoming more so every day), it's vital to keep your psychic energy focused on the things that matter most. Exercising personal restraint and preferring simplicity can help you stay glued to your purpose, on your goals both big and small. Restraint and simplicity reduce the possibility of distraction. Action cures fear; apparently, it also imparts purpose. The final piece to the making of meaning is self-knowledge, the process by which you sort through conflicting choices. Based on your personal history, preferences, and passions, you must filter the available options to select the goals that truly reflect who you are and what you mean to the world. Example: At any given moment, I have many options available to me. Do I want to write another book? Do I want to speak at a conference in India? Do I want to continue to write about money? Do I want to study Spanish? Do I want to travel more? Less? And so on. Most of these options are good (by which I mean they're positive, both for me and for the world). Who I am and what my life means is a product of the opportunities I choose to pursue. Ultimately, it's up to each of us to discover our life's purpose though a combination of simplification, action, and self-reflection, by being true to who we are and what we believe, and be setting goals we find worthy of pursuing for their own sake. There are 21 reader responses to "How to be happy and lead a meaningful life". Your posts are simply just too darn long. I don’t have the time to read them fully. Which is a shame because I know they are jam packed with good, solid info. I read a few paragraphs and then move on. This one has too many concepts. I liked the first part about happiness and then it lost focus and I skimmed the rest. It was too long. As for happiness, I’ve been mulling about this as well. I think we are shooting for the wrong thing. Happiness is good, but it’s a peak state that can’t be sustain. You can achieve flow, but you can’t really stay there long. The more you get into the flow, the harder it is to get there – because you become more proficient. Instead of happiness, I’m beginning to think contentment is a better goal. That’s a steady state that is more achievable. I need to do a bit more research on this one. Joe, I liked that you talked about contentment. I think you’re right, it might be more achievable. J.D., I like that you are being inclusive of both genders when you use your pronouns. I appreciate that. This is an outstanding post, well worth the investment of time it took to read it completely. Thanks for taking the time to write it and share it. It’s especially relevant to me because I enjoyed Covey’s “Seven Habits of Highly Effective People”, Browne’s “How I Found Freedom in an Unfree World” and I am currently reading Frankl’s “Man’s Search for Meaning”. I have been trying to figure out the best way to share some of these concepts with others (in particular my teenage kids) and this post might just come in handy. Thanks again, your work here is very much appreciated. I disagree a bit with Cindi above. Yes, the posts are long but they are fantastic. If the reader can control their lack of attention and read the whole thing they will benefit from this stuff. My takeaway from this one was that doing challenging work makes us happy. I’m seeing it in my day to day too. The money stuff is easy and natural for me. So is my day job that’s not very rewarding. Writing, on the other hand, is not. I failed out of scholars English in high school. Trying to take my logical, coherent and clear money thoughts and explain them in the written form is very challenging to me. The more I do it, the better I get and the more I enjoy it. What an amazing article, thanks J.D.! I’ve got to spend more time reading this whole post, but oh my, this is so good. I wanted to comment about the external and internal locus of control. So many (perhaps subconsciously) think doctors are responsible for their health. So the locus of control is external. Years ago, I thought, what would can I do to be healthy, and I came up with living next to a good hospital. But I’ve since learned by putting the locus of control upon me, and being responsible, the chances of heart problems, digestive problems, stroke, cancer, etc., can be greatly reduced. This might be one of your best posts. I loved what you had to say and it came to me at a time when I needed to hear this message. Thank you. J.D. this article is so timely for me right now. 2017 was a very unfortunate year for me. I experienced a difficult diagnosis, and while treatment seems successful and the prognosis positive, I’ve been left with some physical limitations that are difficult for me to accept. On hard days, I think, “this isn’t fair,” or “I’m only forty, why has this happened!” But the truth is, the reasons why are out of my control. What I’m left with, as you said, is pursuing happiness intentionally, by focusing on what I can control rather than what I can’t. It isn’t always pretty, but I’m choosing to focus on my attitude, on how I respond to what’s happened. Sure, I’ve lost some things, but I’m alive and I can control what I think and do from here on out. 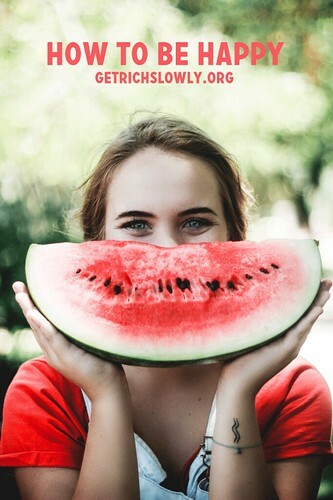 I am experiencing right now the truth of what you said, “Happiness isn’t something that just happens; happiness is a byproduct of the things you think and say and do.” We are never slaves to our circumstances. There are always ways to change our situation or attitude. I don’t think your article was too long at all. Thank you for taking the time to right it so thoughtfully and thoroughly. It’s a great reminder that being focused and intentional about today and the future isn’t passive or easy. It does take patience and work . But all that effort is a fair price for being a happy and intentional person who does meaningful work. Amazing piece. I’m new to reading your blog, but what a hell of a start! Great content, as always. No complaints that it is too long from me! Thank you for all of the time and energy that you have put into these recent posts. They are well written, and distill very complex topics well. I like that they are balanced, and show your own personal journey through this. I do agree that future posts like this might be better served to be broken down into sub-topics, but the information is solid and should definitely be shared. Another great post. Thank you! I really appreciate how you distill information from a variety of sources and provide a recap at the end. I only wish I had come around to all this—on finance and happiness—a bit earlier in life, but I am looking forward! I’m hoping I can turn happiness into a habit! Terrific post, I’ve copied the bits that hit me the hardest and saved them for later. The joy of reading, folks, you don’t have to digest it all at once, read and ponder, come back and enjoy again! Thanks. JD, Great post! One of the reasons I like your writing is it is deep. You don’t scratch the surface in sound bites. I come to learn and you deliver. I think the hardest thing in life is to learn what makes you happy. (I still haven’t figured it out fully.) So much IS outside our control and when I was younger I felt as if I was doing life wrong because so much was going wrong with my circumstances. The day I realized that I couldn’t control all that was outside me was a game changer. I can’t control other people, what they do, how they act, illness, etc. Now when I get frustrated about what’s going on, whatever that may be, I take a deep breath and if able (like not in public!) I reach my hands up, around, and down and remind myself that the only thing I can control is within my reach. The end. And mostly within my reach is me. Terrific collections of ideas and readings on Happiness, J.D. Yes, the U.S. is the only nation in which the “pursuit of happiness” is baked into its birth and its identity. That was a fascinating new Enlightenment concept, that people actually deserved a chance to create their own happiness (not, of course, simply to have it handed to them, which is not only impossible but also won’t result in the outcome). The right to a pursuit of happiness is an idea and responsibility so familiar to us, we take it for granted and no longer marvel at the step forward it was in the 18th century. You do a fine job of approaching this from multiple angles, and underlining the necessity to work toward and to earn individual happiness. It saddens me to read that some of your readers have short attention spans, or think that a blog post must have only one, easily digestible idea. Or perhaps they are overwhelmed with busy-ness. This seems to be rampant in our hurry-up anti-intellectual culture that wants quick fixes and simple ideas. What you have written here needs to be thought about—and enacted. Happiness is worth the effort. Contentment takes effort to define and earn. Taking this path goes against the grain of contemporary life, with all its strivings, acquisitiveness, comparisons and nagging discontent. Awesome article, J.D. ! It’s really incredible the amount of effort you put into your posts. Keep it up! Just started reading your blog in the last couple of days and really enjoy it. As far as your life expectancy, take care of yourself. i want to keep reading you for years to come. I would add to all this the importance of environment and having the support of others. We can get straight about who we are and what we have to do, but there are potholes on the journey! You could say that all great men and women have reached their goals ONLY with the help of friends and mentors. Sometimes people succeed just by finding their “tribe” and using the group’s knowledge and encouragement. Our culture is always focusing on what you as an individual need to do to making things happen, but if you put people in the right environment change is much more likely. JD this is a Masterwork of distilled and interconnected wisdom. Aristotle, Csikszentmihalyi, Lyubomirsky, Browne, Frankl, Rotter, Covey, Tolle … all woven into one post. Add you name to this impressive list as a Curator of seemingly different philosophical relatives of the same family! Bravo!